Vietnam vet and former pro football player Wyatt Storme is bow-hunting in Missouri when he stumbles upon a hidden field of marijuana…and is attacked by a vicious dog and shot at by a sniper. He reports the violent incident confidentially to the local Sheriff…who is murdered the next day. 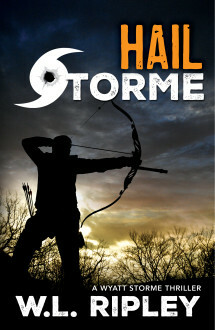 Storme believes there’s a connection and starts asking questions, unraveling a deadly conspiracy of corruption, drug-trafficking and organized crime… and making himself someone that just about everybody wants dead. Great fun. Damn fine writing. Jack Reacher with a bow and arrow. Prose beautiful and forceful. Like a clean punch to the jaw.